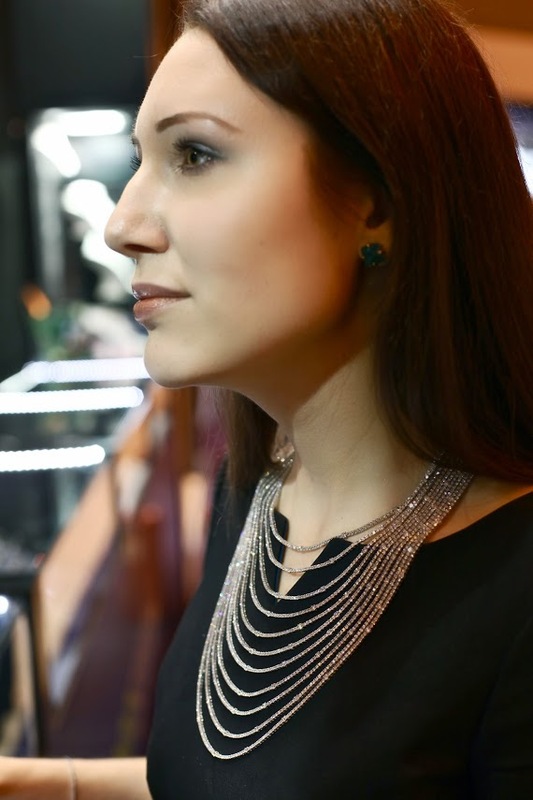 In our very first collaboration together I present you fine jewellery blogger Katerina Perez who selected her top 10 finest creations of luxury jewels and gems on offer at International Jewellery London 2013. Here she expresses her precious finds and uncover favourite gems whereas I report on the emerging talents of independent jewellery designers. International Jewellery London is the biggest annual jewellery fair in the UK. 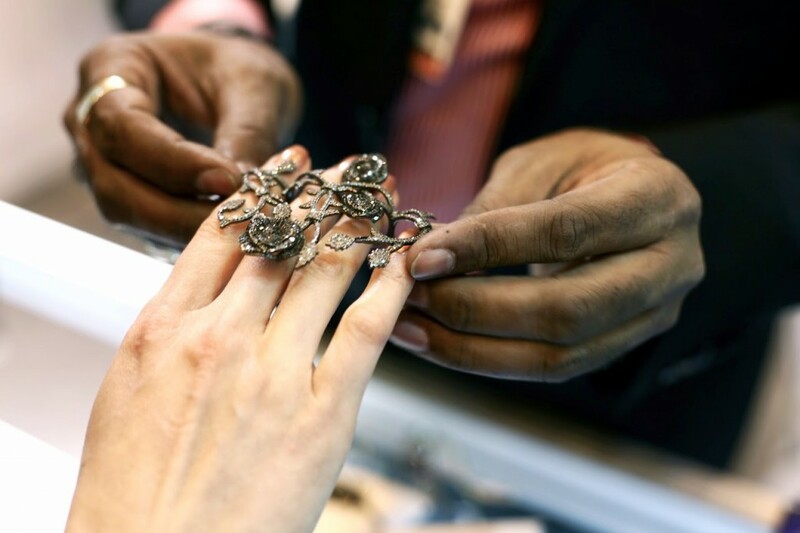 This year approximately 600 participants from all over the world gathered at Earl’s Court to display their best products, which included fashion and fine jewellery, loose gemstones and diamonds, packaging, and manufacturing tools. There was definitely a lot to see! I am sure you would agree that choosing from about 10,000 jewels of various designs and styles is not an easy task. 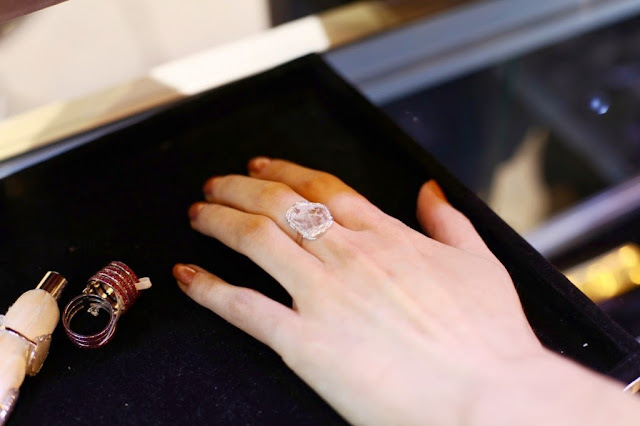 To higlight different aspects of the fair I joined forces with my fellow blogger Isabella Lee from Rockin’ That Gem. She took care of the Designer Gallery while I was searching for the finest pieces in the Fine and Precious area of IJL2013. Having seen a lot of pieces and in choosing the best ones I have purely relied on my own personal opinion. 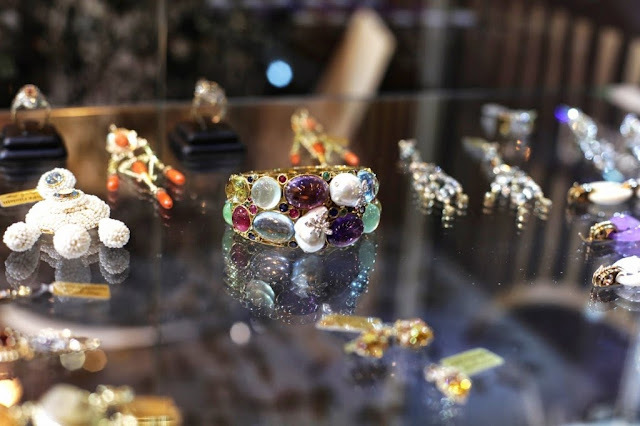 Each jewel has been analysed not only from an aesthetic point of view, but also with respect to their intricacy, the labour intensity required to create them, the use of rare precious stones, the manifestation of original ideas, and correspondence to fashionable trends. All of them are completely different from each other, although there is an overall similarity, namely high quality. A tender, flowing cascade of diamond chains shine like the May sun. 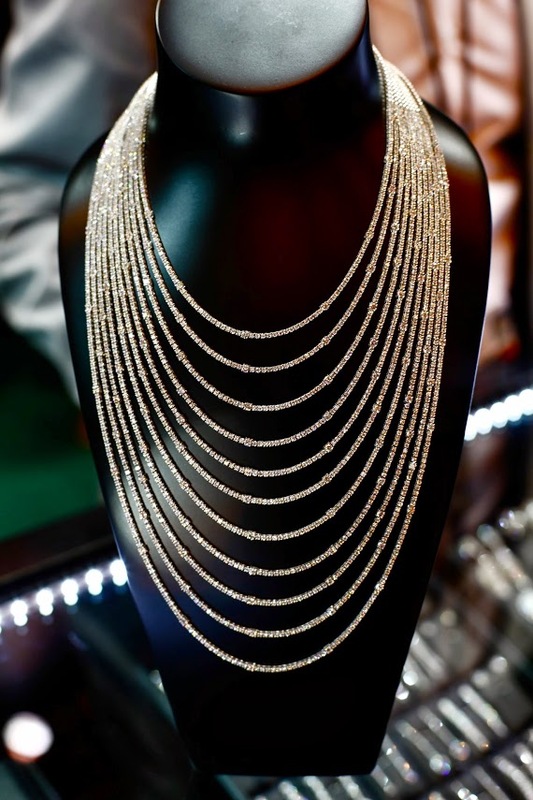 Such a necklace would be ideal for any lady; no one could feel indifferent towards it. Glittering with 57 carats of colourless diamonds, this necklace is glamour in its purist form. To create such an exuberant composition of precious stones, a jeweller needs to work tirelessly for a total of three weeks. However, I would not necessarily call Luigi Ferrera a jeweller; I’d more readily call him an artist. The bracelet looks like a palette with precious stones instead of painting colours. Here can be found bright blue topaz, pale blue chalcedony, indigo coloured sapphire, and violet amethyst. The red hues spattered on the jewellery canvas come from the pink tourmaline and cherry-coloured rubies. These are perfectly accentuated by white diamonds and smooth pearl. 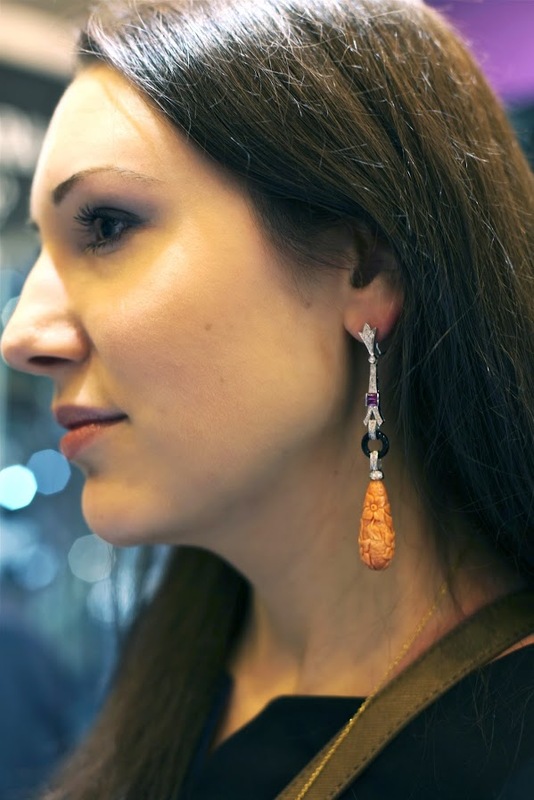 To put it simply, Luigi Ferrera is jewellery’s answer to Matiss. 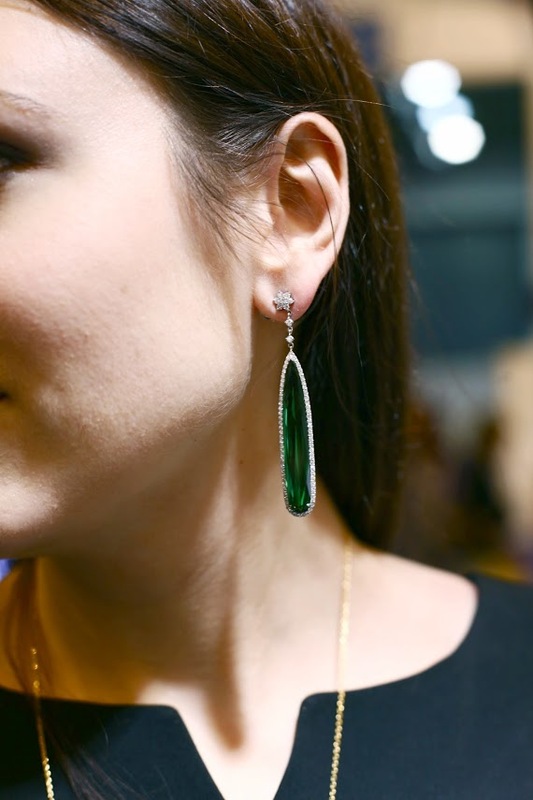 Teardrop shaped, 35 carat deep green tourmaline stones from Brazil are simply dazzling. Fitted in a simple diamond frame, they glisten richly in the light, drawing your gaze. 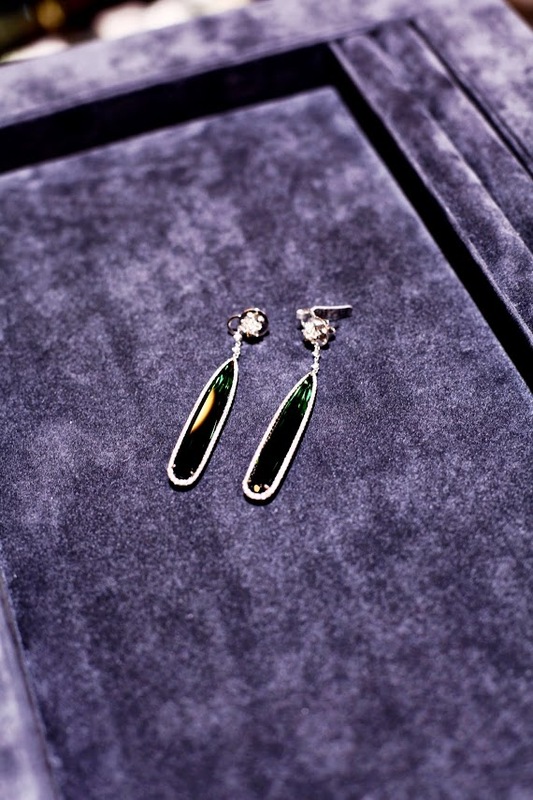 After wearing this refined, elegant piece just once, you will never want to take it off. A frame made from white gold and a thin line of diamonds acts like a cosy cradle for a rough diamond slice in the centre. To my mind this piece is elegance itself. One glance and you get the impression that you are looking into a window decorated with intricate frosty patterns on a winter’s morning. A Gemco necklace with silvery green tints that resembles a precious fleece which, when worn with a décolleté gown, shrouds the wearer with its soft, entwining mesh. The blackened silver lends a distinguished look to “ice” diamonds and milky emeralds. A piece like this would delicately envelop and “warm” the heart of any woman. Wearing a ring on just one finger is so yesterday. 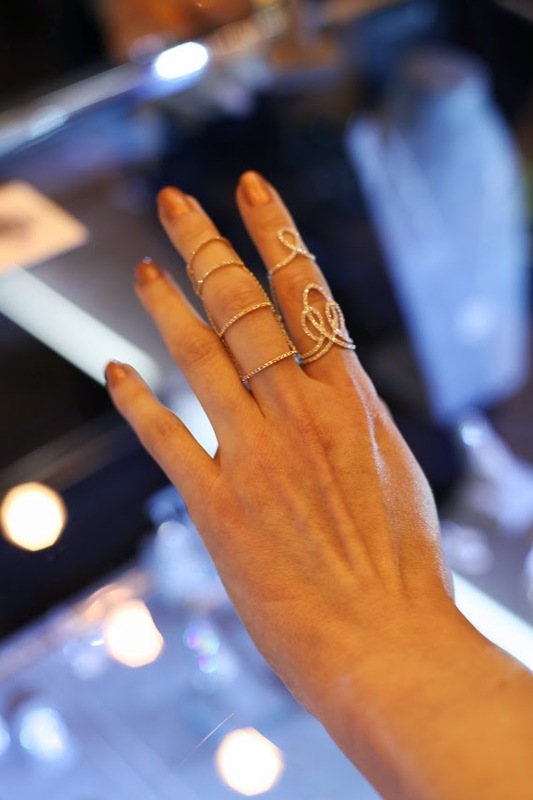 A new trend which has come from the fashion world into the jewellery industry is the knuckle ring. A couple of seasons ago, decorated with skulls, they looked more like punk accessories. 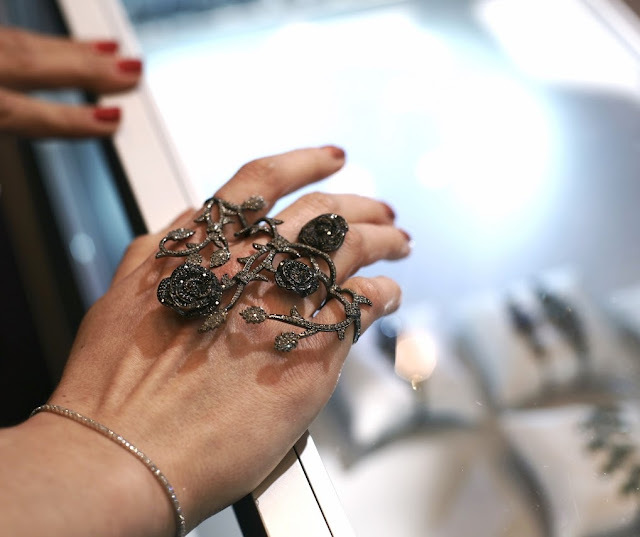 Lately, however, this type of ring has gradually assumed elegant designs, even if an aura of rebellion and mutiny has yet to disappear; barbs on the little stems of white and black diamond roses that tenderly wind around the fingers are a testament to this. 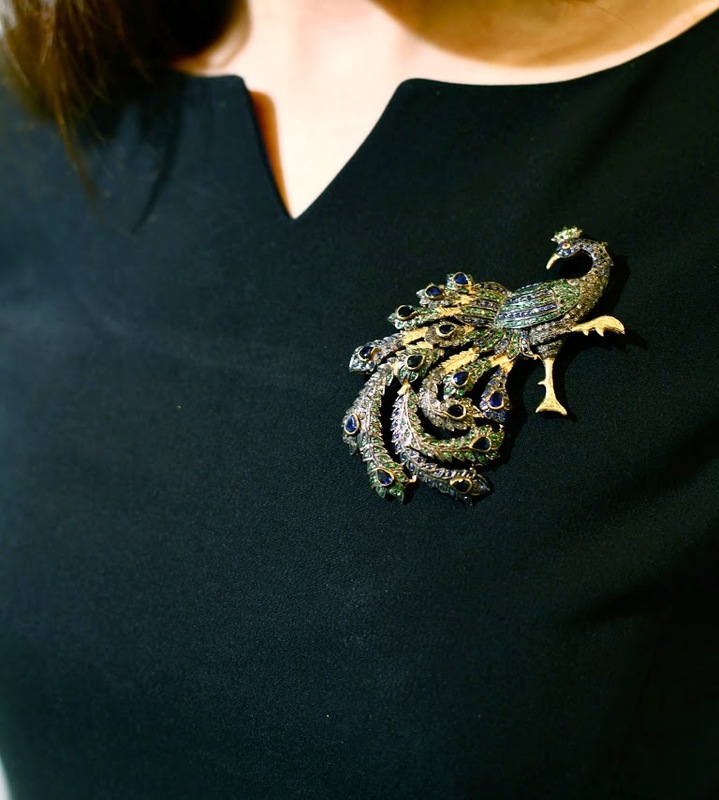 I saw Eleuterio’s filigree pieces for the first time at an exhibition in London. Now I find myself struck dumb once again by the grace of the design and the delicacy of the work. The jewellers who spend days making miniature ringlets from gold thread that has an ethereal, ornamental composition need to be given their due credit. A few diamond scatters and you have a golden water-lily before you, its little petals blossoming under the sun. Now, this is what I call Parisian chic! 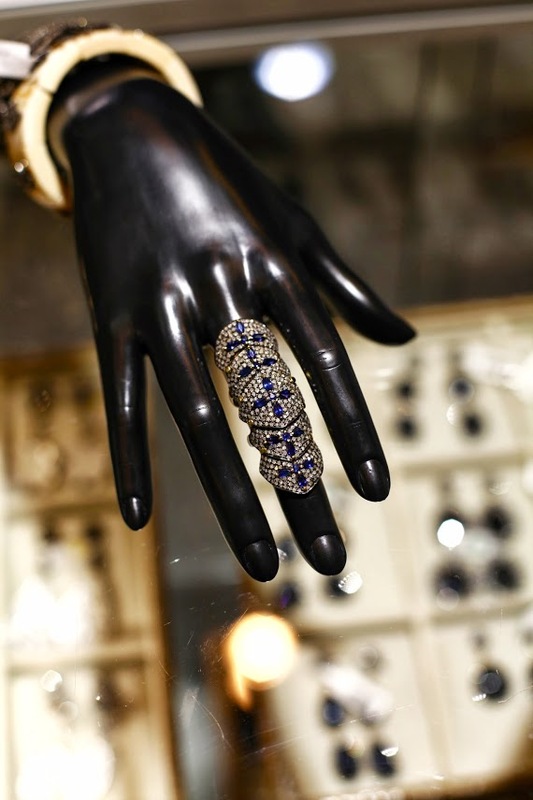 Delicate diamond lines of this jewel are barely there, yet these two sophisticated rings are a fashion statement. For the past few years, many jewellery designers have revisited their love for rose cut diamonds which look as though they have a faceted dome from one side and a level face from the other. These are what cover the curved surface of the Amrapali ring over which, like two snakes, strings of diamonds twist and entwine with circular teardrop diamonds hanging from them. This piece epitomises all that is exotic: with a barely audible jingle, the stones sway, mimicking your movements as if performing a bewitching Indian dance. 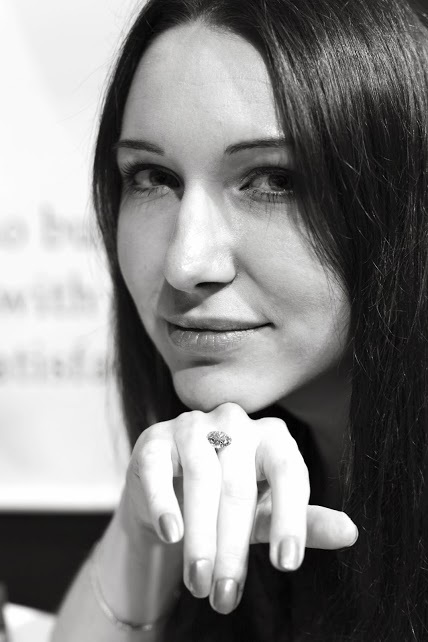 Katerinaperez.com is a blog about passion… passion for Fine Jewellery and Exquisite Gemstones, fine Jewellery as a form of Art. 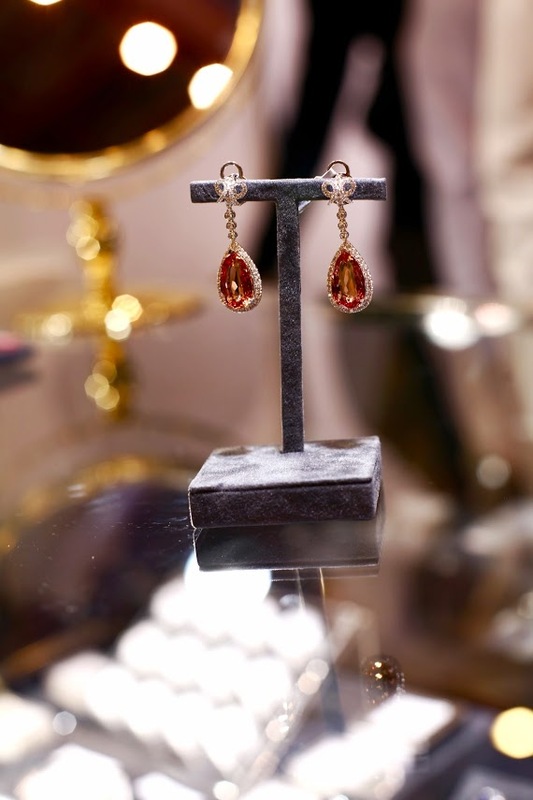 The blog was created by Katerina Perez who is a Gemmologist and the Jewellery Editor of V V Magazine - a Russian-British glossy published in London. 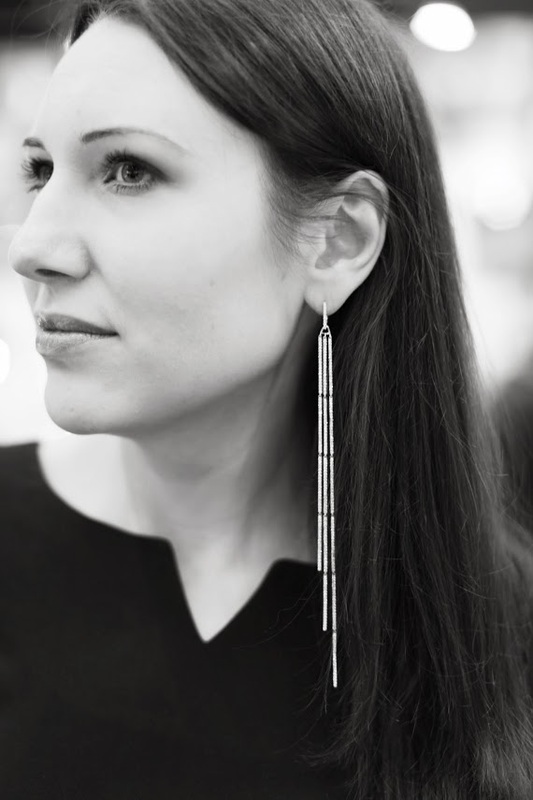 On her blog Katerina shares her discoveries of all things fine and precious, covers jewellery novelties and trends, highlights recent and upcoming events and posts interviews with some prominent people in the jewellery industry.